ID: Red to brown rough shell. Massive size. 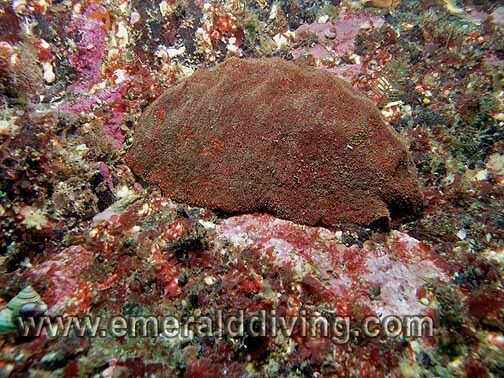 Comments: The gumboot chiton often looks like an old discard mount of leather clinging to the reef. 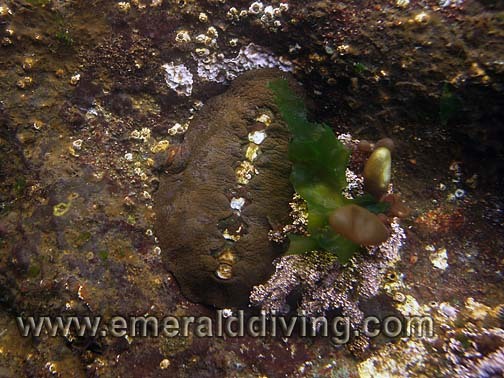 I often noted these giant chitons on rocky reefs throughout Washington waters. ID: Color varies greatly. Fine wavy lines on shell plates (valves). Smooth girdle with colorful blotches. Comments: I commonly note the lined chiton when diving Washington waters. I often find dense populations of these chitons clinging to old discarded appliances at Three Tree Point. 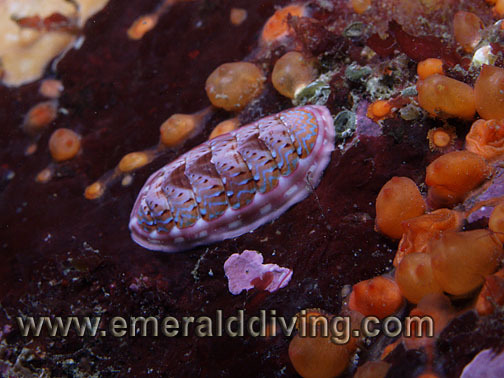 This species is difficult to distinguish from the blue-lined chiton. ID: Brown or green shell plates (valves). Small hairs along girdle. 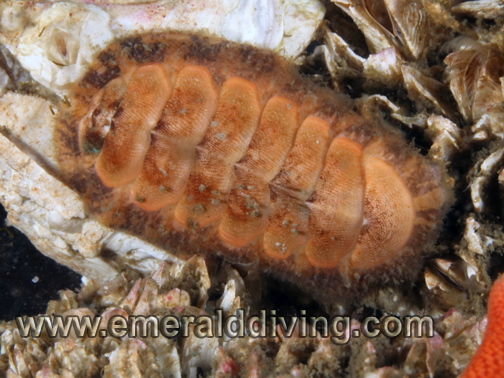 Comments: The smooth mopalia is another common chiton found in Washington waters. ID: Thick "padded" black or brown shell with indents white patches running down the middle. 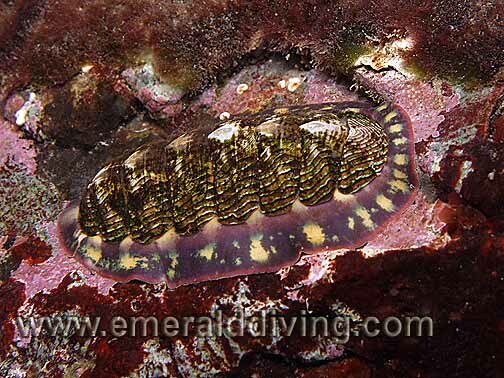 Comments: I often note this aptly named chiton when I snorkel around exposed rocks exposed. 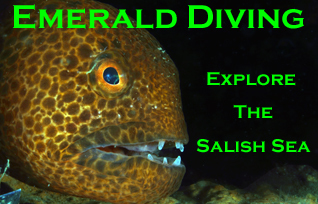 I took this photo while snorkling around Mushroom Rock at Cape Flattery. A group of these chtions were foraging just below the surface. ID: Distinctive blue zig-zag lines on shell. Smooth girdle with colored blotches. 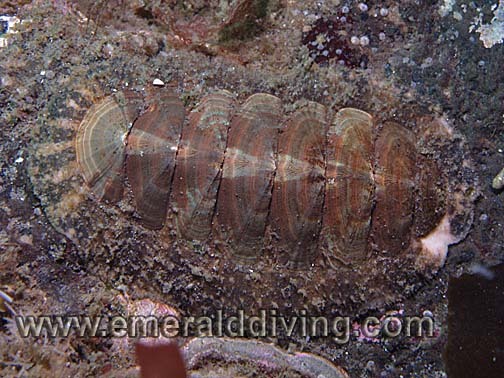 Comments: This species is very similar in appearance to the lined chiton. The blue zig-zag lines are the only visual identifier that I know of to distinguish this species in the field. Photography taken at Long Island in the San Juan Islands. ID: Very small hairs on the girdle. Center of valves are often lighter in coloration. Comments: Chiton identification can be very difficult. I had to send it to several experts to identify the species imaged here, and even with that these is some uncertainty. Photographed at Peavine Pass, San Juan Islands. ID: Banded girdle (which many chitons have) and reddish valves. However, purple variations have also been noted. Comments: Also called Merten's chiton. 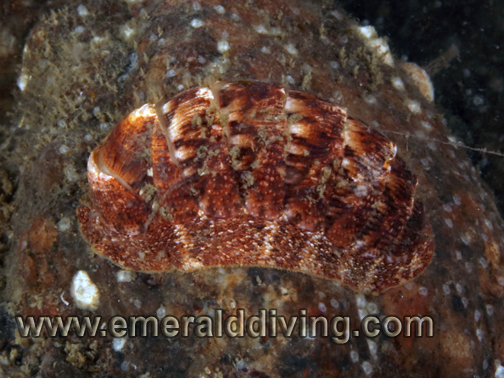 Chiton identification can be difficult at best, especially given color variations. Note banding on the girdle of this specimen, combined with it's reddish exterior. ID: Thin, wavy white lines on each plate. White lines form a triangle pattern. Smooth girdle. Comments: This chiton almost looks cartoonish with billiant and orange and white color. Photographed in God's Pocket Bay, Hurst Island. ID: Turqoise, orange, and red marks on shell. Girdle can be very wide. Hairs on girdle are heavily branched. Comments: Chiton are difficult to identify. 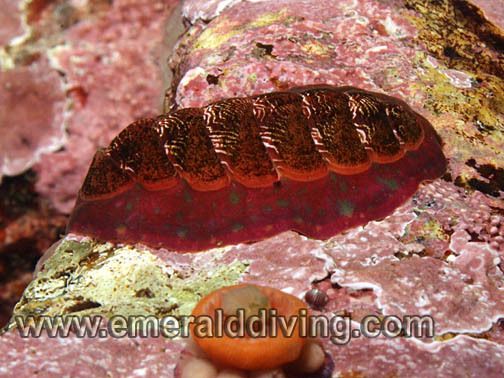 Identification is often done by close examination of the small hairs along the girdle of the chiton. 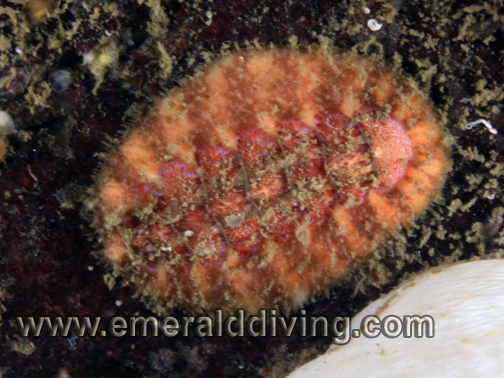 Thanks to Andy Lamb and Linda for identifying this chiton. Photographed at Whale Rocks in the San Juan Islands.